The Mad River Craft Fair is this weekend (Labor Day), Saturday and Sunday from 10-5:00. This is one of my favorite shows. The Mad River Valley is a beautiful setting and there are so many talented artists selling their work. Along with most everything on my website I’ll also have scarves and fingerless gloves. I recently purchased some lovely alpaca, merino and silk yarn. 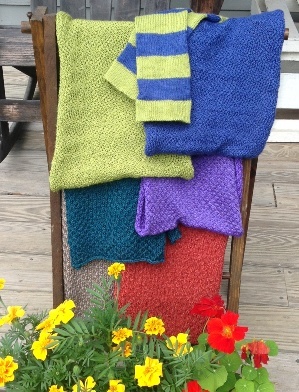 My favorite is the Jaggerspun merino silk blend, wonderfully soft, lightweight and warm. I’ve made both scarves and fingerless gloves in this yarn. Stop by the show and say hi and try on one of my new creations. New Logo by Zoe Ink ! © 2019 K.D. Hill Knitwear All Rights Reserved.